Once you begin adding quality scores and marking checklists, you'll have a wealth of information and can systematically make money-saving improvements. Add notes to each score explaining the reasons for the score and to communicate the problems you encountered. Your FTQ360 software will be fully loaded with trade and task-specific checklists. As part of you normal inspection process, check those items that are not first time quality complete. This becomes part of your inspection record with each checklist item (associated to a vendor and task) automatically entered into you project database. Sign up for a Demo or Contact us at 410-451-8006 today for more details! 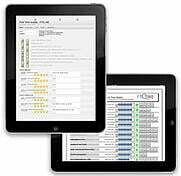 Review checklists and perform in-field inspections using FTQ360 mobile. Contact us at 410-451-8006 today for more details!